The Inflatable Air Lounge Sofa Bed is the latest multi functional piece of furniture that you must have around. It looks good and comfortably seats 3 people, instantly converting into a bed if you want. Simply unfold the base of the sofa into a bed, throw in a couple of pillows and a duvet and chill-ax to your hearts content! can set-up and use anywhere in the home! FEATURES: • Perfectly convenient • Short of space and need some extra furniture fast? 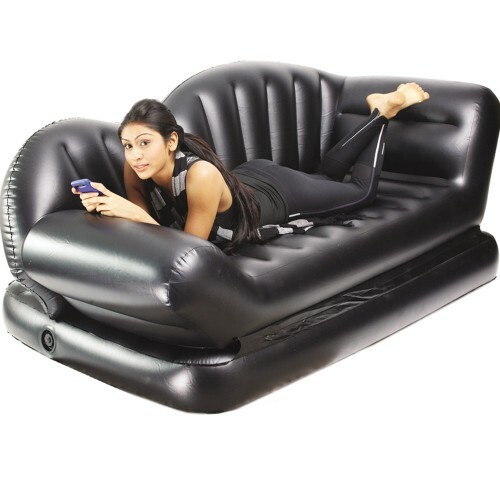 The Air Lounge Inflatable Sofa/Bed can be quickly and easily set up – just pump it up! • A full pull-out sofa/bed in just minutes • The Air Lounge Inflatable Sofa/Bed comes with its own Jet Propulsion pump which can fully inflate the Air Lounge in under 3 minutes. • And when you're not using the Air Lounge, it can be easily stored away. It\\\'s light enough to be transported to any part of the house or it can be folded away into the included nylon carrying bag – meaning you can truly bring it anywhere you go! • It's also a bed! • In addition to being a comfortable sofa, the Air Lounge Inflatable Sofa/Bed can easily become a comfortable bed or recliner. Just flip open the bed from underneath the sofa, and you've got a nice place to sleep! • The Original Air Sofa Bed…made of high Quality superior material that could last a lifetime.